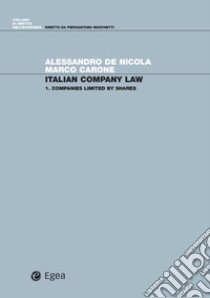 This book offers a general outlook of the legal framework governing companies limited by shares under Italian law for students, scholars and legal practitioners. It contains a presentation of the theory of the firm and its connections with Italian company law, in an effort to move these concepts closer to the understanding of international readers. The Authors have been teaching Italian business law to international students at Bocconi University in Milan for many years and this book owes much to their academic experience. At the same time, however, the Authors have leveraged on their experience as international business lawyers in order to keep the explanation plain and practical to any possible extent.